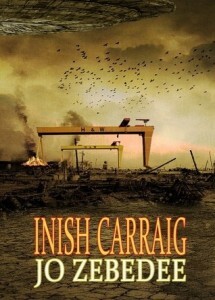 Inish Carraig begins a few months after an alien invasion has devastated most of the world, including the book’s setting of Belfast, a city that has suffered terrible deprivation during the invasion and the aftermath. Even after a cautious peace breaks out when the aliens are forced by the interstellar Galactic Council to work together with the locals, life is still very hard for the survivors. Initially the story follows two teenagers scavenging among the ruins of the city to try to keep the rest of their family fed, after unwisely choosing to take on a job from a local criminal gang they find themselves targeted both by the aliens and the remnants of the local law enforcement. At this point the scope of the story expands as it becomes clear there are two different alien races competing with each for control of Earth with humanity caught in the middle uncertain of who it should ally itself with. There have been a lot of alien invasion stories over the years, and while this sometimes feels reminiscent of other stories (I was reminded of the TV series Falling Skies at times) it does have some elements which distinguish it from the rest of the genre. The most obvious is the Northern Ireland setting, since I’m not aware of any other alien invasion stories focuses on there (Ian McDonald’s “Sacrifice of Fools” would be closest, but the aliens there are refugees rather than conquerors). The book does use its setting well, where even after an alien invasion the characters don’t forget about their complicated heritage. I thought the characterisation was good throughout, showing how characters who had fairly unremarkable lives up to the time of the invasion have had to adapt to survive in a desperate situation. John and Taz, the two teenage protagonists, have a believable combination of vulnerability and bloody-minded determination. Probably the best character is Carter, a police officer trying to do his job as best he can despite being regarded by most of his fellow humans as a collaborator for being willing to work with the alien authorities. The story moves at a good pace and packs a lot of plot into a relatively short book. Sometimes it would have been interesting to hear a bit more about the aliens themselves and their motivations (particularly the Xelotyr), but it would have been difficult to incorporate this into the plot given that the characters themselves don’t know much about their new alien masters. While this is understandable it does mean that the story feels like it lacking in depth a bit at times. One bit of plotting that felt overly convenient at times was the droids that accompany John and Taz for most of the book, while a fun addition to the story they do seem to manifest new abilities whenever the plot demands it. Overall, I thought this was an entertaining alien invasion story which made good use of its Belfast setting.